U.S. forces take up positions on the outskirts of the Syrian town, Manbij, a flashpoint between Turkish troops and allied YPG fighters on March 7. The PKK's Syrian offshoot the Democratic Union Party's (PYD) close relations with both the U.S. and Russian Federation, have seemingly perplexed Washington since U.S. Chief of Staff Joseph Dunford speaking to the U.S. Senate made contradicting statements on the matter. "The group that we are supporting, certainly at the political level, are engaged with Russia," Dunford said, referring to the PYD's armed wing, the People's Protection Units (YPG). Regarding the YPG's collaborations with the Kremlin on the ground, Dunford said: "The YPG has a political office in Moscow itself but the groups that we're providing support to on the ground are not being supported directly by Russian military forces." Yet, it has been observed that the YPG is receiving help from Russian forces around the towns of Manbij and Afrin in northern Syria. 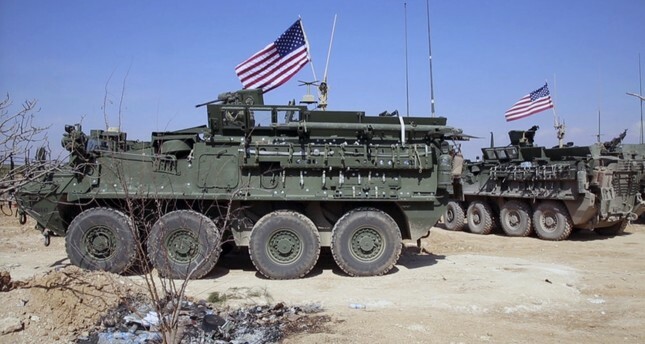 Moreover, the Russian General Staff earlier in March confirmed reports of a regime takeover in Manbij, which is currently held by U.S.-supported Syrian Democratic Forces (SDF), dominated by the YPG. In addition to the regime presence, Russian armored vehicles and troops were also seen in the area. Özcan Tikit, a columnist for Turkish daily Habertürk who focuses on the developments in the region, said that the White House and the Kremlin only seem to be fighting, but "the current situation benefits both the U.S. and Russia," as both countries would enjoy a divided Syria. Tikit asserted that the YPG's policy of keeping close ties with both Washington and Moscow was motivated by their own agenda. "Looking at the YPG's stance objectively, their approach towards the U.S. and Russia only benefits themselves," he said. The YPG, which aims to connect its cantons in northern Syria in order to form an autonomous terrorist state, has been working with the Kremlin and Washington for a while. While Russian troops have been seen brandishing the insignia of the YPG terrorist group recently, in a similar incident in May 2016 U.S. soldiers were seen wearing the YPG insignia. While the U.S. lists the PKK as a terrorist organization, it does not recognize the PYD as such, despite countless evidence provided by Turkish authorities that prove the undeniable links between the PKK and the PYD. Relations between Turkey and the U.S. have been strained since the Obama administration voiced its support for the YPG. Meanwhile on Wednesday, Russian charge d'affaires in Ankara was invited to the Turkish Foreign Ministry to communicate Turkey's unease regarding sniper fire from a PYD-controlled area in northwestern Syria's town of Afrin that killed one soldier, according to Foreign Ministry spokesperson Hüseyin Müftüoğlu who spoke during a press conference yesterday. Turkey also expects Russia to take necessary steps for closing down the PYD's office in Moscow, Müftüoğlu said. The spokesperson added that restrictive measures posed challenges in putting the materializing the common will to increase the bilateral trade volume between Turkey and Russia. hat involved the PKK/PYD terrorists, deputy Prime Minister Numan Kurtulmuş confirmed. Any operation to capture Raqqa should involve "moderate opposition" forces in Syria, he added. "Turkey will also support such an operation," Kurtulmuş told the Anadolu Agency's (AA) Editor's Desk on Wednesday. "However, if you are saying, 'We will bring in the PYD while taking Daesh away,' Turkey will never allow it. We will not be involved in such an operation."